Even as elevated highways go, the Casey Overpass is an eyesore. The concrete piers are cracked and stained, and the steel deck is a patchwork of rust and rust-colored paint. The jarring road surface always seems to be under construction, and the fragile outside lanes have been permanently closed for stability. 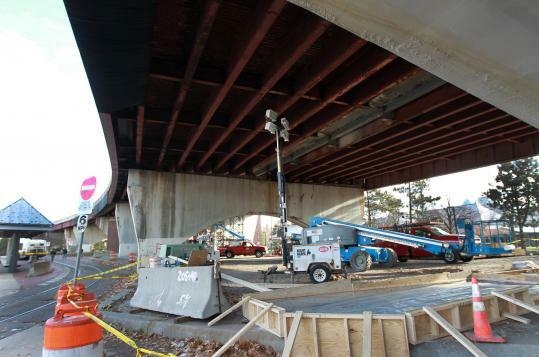 The 57-year-old overpass — which carries the Arborway, also known as Route 203, between the Arnold Arboretum and Franklin Park above Jamaica Plain’s Forest Hills neighborhood — is literally beyond repair, and state officials intend to tear it down. What they are trying to decide is how to replace it or even whether to replace it at all. The Department of Transportation is mulling variations on rebuilding, building it smaller, and eliminating it entirely while improving the surface roads that exist in its shadows. As early as this month, state officials plan to present concepts to the community and begin developing a favorite with local input. The project offers an opportunity not just to remove an ungainly vestige of 1950s highway construction, but to mend a missing link in the ribbon of parks known as the Emerald Necklace. And the state’s approach is an about-face from the era that produced the Casey, when officials intent on building roads bigger and higher for suburban-bound car owners paid little heed to the urban neighborhoods they bisected. Mullan quoted a favorite line of Mayor Thomas M. Menino’s — “The car is no longer king’’ — and said the Department of Transportation is rethinking what he called “over-engineered’’ and “structure-intensive solutions’’ and paying more attention to “urban context issues,’’ in other words, reconsidering the building of hulking, multilane speedways where more modest roads might do. The state is thinking about similar downsizing at Route 79 in Fall River and the McGrath-O’Brien Highway (Route 28) in Cambridge and Somerville. On Rutherford Avenue in Charlestown, which doubles as Route 99, the state is working with Boston to explore ways to make that partially submerged, eight-lane road into a boulevard more friendly to bicyclists and pedestrians. The Arborway began as a leafy carriage road, designed by Frederick Law Olmsted, to connect the Arnold Arboretum with Franklin Park in the late 19th century. But by 1950, the Metropolitan District Commission officials who had assumed management of the road were less concerned with aesthetics than with beefing up the road for more cars. The MDC built the Casey overpass at the same time it expanded Storrow Drive along the Charles River from a meandering parkway to a multilane highway, and it built the Casey big and wide enough to carry double the 24,000 cars that now cross it each day. During construction, the overpass was praised in the Globe as a marvel of the modern age. The government considered highway construction so important that the builders of the Forest Hills overpass (after its opening, it would be renamed for the late Monsignor William J. Casey) had no trouble obtaining 5,000 tons of steel, even amid a shortage during the Korean War. Now the Casey is a rattletrap, one of hundreds of long-ignored spans across the state deemed structurally deficient and destined for repair or replacement under a $3 billion Accelerated Bridge Program approved by Governor Deval Patrick and the Legislature in 2008 after a fatal bridge collapse in Minnesota. As a Band-Aid until the Casey is dismantled, the state closed the outer lane on the westbound side a year ago; the outer lane on the eastbound side closed in the fall. Even with $1.3 million in emergency repairs to the bridge’s pedestals wrapping up, the state will keep the outer lanes closed for the life of the Casey as a precaution, said Adam Hurtubise, a spokesman for the Department of Transportation. He emphasized that the overpass is considered safe. The state plans to dismantle the Casey and begin work on whatever replaces it in mid-2013. That decision will be the product of community meetings that could begin later this month, Hurtubise said. State Representative Elizabeth A. Malia, a Democrat whose district includes the overpass, said the community has been concerned because the state has provided few details. But, she said, she is heartened by a pledge from transportation officials to work with the community. Malia said it would be difficult to imagine surface roads absorbing all of the overpass traffic without a dramatic reconfiguration. “I don’t see it, but I will keep an open mind,’’ she said. Julie Crockford, president of the Emerald Necklace Conservancy, said that even if the elevated road is only rebuilt on a smaller scale, the change could be a dramatic improvement.